GRAPELAND – The 72nd Annual Peanut Festival is just under three weeks away and the Grapeland Noon Lions Club is busily preparing for the social event of the season in East Texas. During a meeting of the Lions held on Thursday, Sept. 21, the Lions began to ramp up their efforts in preparation. The theme for this year’s festival is “Under the Sea” and after the meeting formalities had been dispatched, President Mike Goolsby initiated the Peanut Festival discussion. “The minutes mentioned we would have sign-up sheets in this meeting. I’m going to send around three separate sheets. These are if you can help on these projects. Two of these are for parking on that day (Oct. 14) and working in the food booth. We will need people there from at least 8 a.m. – especially in the parking area – until at least 2 or 3 p.m.,” Goolsby said. “The third one is for float building and of course that is done earlier. If you are able to help with the float building, please sign up,” Goolsby added. 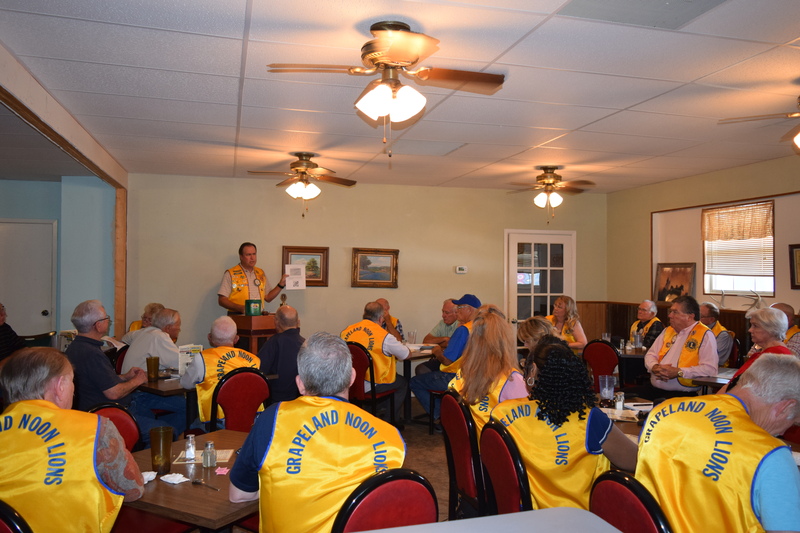 Following the initial discussion, Lions Club Treasurer Allen Cheatham provided an update on the Spot Vision screening conducted by the Lions. Cheatham said approximately 70 students were screened at Grapeland Elementary on Tuesday, Sept. 12. “Then Crockett, Kennard and Latexo contacted (Lion) Eddie (Childress) about screening their kids. So on Thursday, we went down to Crockett and screened about 123 students. That afternoon, we went to Latexo and did about 60 more,” Cheatham said. The treasurer explained the club was scheduled to go to Kennard on Friday, but a scheduling conflict with Kennard ISD prevented the trip. After a few more items were addressed, Goolsby re-directed the meeting back to the Peanut Festival. He said he was meeting with Peanut Queen Contestant Madelyn Conner later in the afternoon on Thursday to discuss ideas about her float and encouraged any Lions who wanted to attend to join him at 2:30 p.m. for the meeting. Conner is being sponsored by the Lions in this year’s event. Goolsby informed the club the cleanup of Millican Cemetery went very well. The trash pick-up held by the Lions went very well according to Goolsby. The Lions will be starting their street striping project within the next week. Carl Kellum was voted in as a member of the Lions. Previous articleHere We Grow Again!